This year’s National Hockey League (NHL) All-Star game won’t just be a showcase for superstar talents like Pittsburgh Penguins’ Sidney Crosby, Toronto Maple Leafs’ Austin Matthews and Edmonton Oilers’ Connor McDavid. 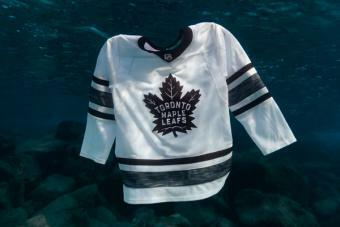 It’ll also be a showcase for the league’s bold, new environmentally-friendly player jerseys. The special edition adidas ADIZERO Authentic Pro x Parley jerseys will be wrapped around players’ shoulders during the 2019 SAP NHL All-Star Skills competition on Friday, Jan. 25 and during the 2019 Honda NHL All-Star Game taking place Saturday, Jan. 26, with both events taking place at the SAP Center in San Jose, Calif., home of the San Jose Sharks. Founded in 2013, Parley For The Oceans is a “global network where creators, thinkers and leaders from the creative industries, brands, governments and environmental groups come together to raise awareness for the beauty and fragility of the oceans and collaborate on projects that can end their destruction.” The organization works with businesses to create more environmentally-friendly, less ocean-damaging solutions. Celebrating things like Corona switching away from plastic rings for their beer six-packs is an example of innovations Parley supports. adidas says it’s committed to increasing the use of eco-innovative materials in its products as a replacement for virgin plastic and a symbol and catalyst for longer-term change.